Following feedback received over the last 2 seasons I am looking to run a LPJS Team competition with the view to setting up a Leon Paul Junior Team series very must like the individual LPJS with a ranking and prizes at the end of each year. Teams can be mixed boys & girls. The first trial event will be at the LPJS Camden Sabre in May. The team events will take place on the same day and following the conclusion of the individual events. Come along for the last Camden Trophy of 2018!!! If you are running late please advise via the usual group chat. NOTICE IS HEREBY GIVEN that the 2018 Annual General Meeting of Camden Fencing Club will be held at The Freemason Arms, Hampstead, NW3 1NT at 18:00 on the 12th December 2018 to transact the following business. Camden Fencing Club - Registered Charity Number 1175788 (England and Wales). ​No Session this Thursday 22nd November!!! Unfortunately the school will be closed for an event on Thursday. So no session on Thursday. This is entirely out of our control. Fencers please feel free to come and fence on Wednesday or Friday. Camden Trophy returns tomorrow for November! Come down to Royal Oak on Tuesday 6th Nov for a great night of competitive fencing. Session starts at 7pm message Ian if you are running late. We are teaming up with the Camden Council Sports Development team to offer sabre workshops to 8-16 year olds in August. Junior club members can brush up their skills over five days at Talacre Sports centre, Dalby Street, London NW5 3AF and if you know anyone who would like to start fencing for the first time, there will also be beginners sessions. The Annual Give It A Go! 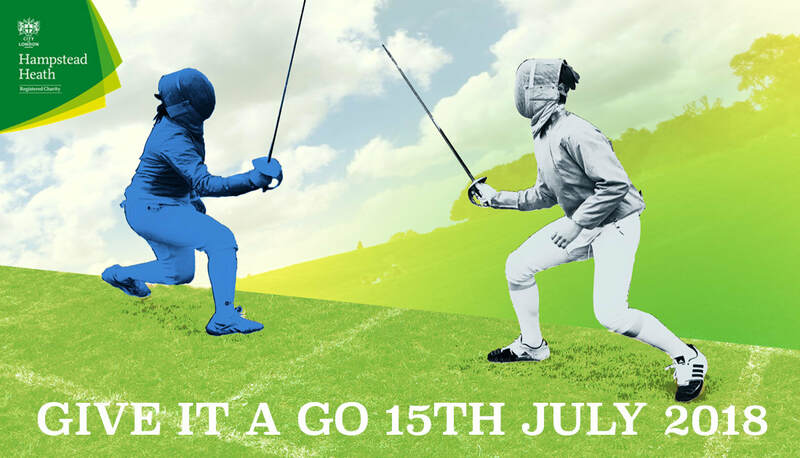 (GIAG) Festival is happening on Sunday 15 July at Hampstead Heath. The event is an opportunity for the whole family to try out FREE sports. So get down to Parliament Hill, Hampstead Heath and take the chance to discover new ways to get active and have fun!